Before you head out on your next hike, take the time to make this quick, easy, and eco-friendly tick repellent, which keeps those nasty suckers away thanks to vinegar. And thisDIY spray costs basically nothing to make and really works. Along with dousing yourself with repellent, knowing how to properly remove a tick keeps you safe and sound from Lyme disease this Summer. An added bonus: this spray is safe to use on your pup, too. 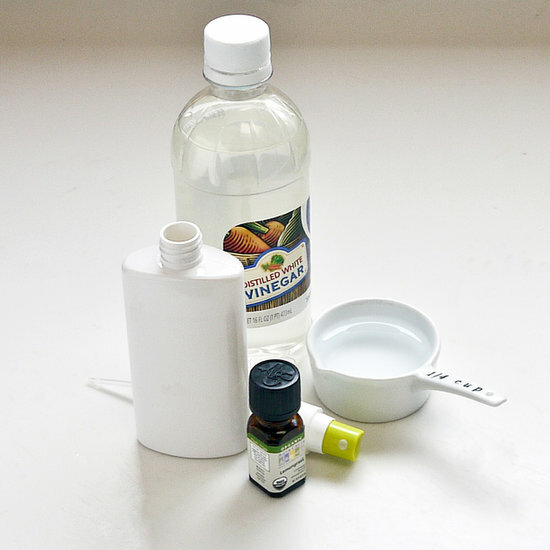 Mix together the vinegar and water in a small spray bottle. Ticks don't care for the taste of vinegar, which repels them from attaching to your skin. Adding essential oil, such as lemongrass, geranium, or rosemary, adds to the repelling qualities of this spray and keeps you from smelling like fresh pickles while hiking. Before heading out, spray your entire body with the tick repellent, especially hair and exposed areas. If spritzing on your faithful companion, then be sure to avoid the eyes, nose, mouth, and nether regions. Dress properly by donning a hat when hiking in heavily wooded areas and thick socks when walking through high grass and thick underbrush. Do a thorough tick check after hiking. Ticks are tiny (and gross) black, brown, or reddish eight-legged insects but do swell once attached to the skin. According to the CDC, when you do find a tick, you should use fine-tipped tweezers to grasp the tick as close to your skin's surface as possible and pull upward with even pressure. Your goal is to remove the entire tick in one pull as quickly as possible after detection. But if the mouth parts remain in the skin, then use the tweezers to remove, or leave it alone and allow the skin to heal. Clean the area, and your hands, with rubbing alcohol or soap and water. You want to have as little direct contact with the insect as possible. You can pop the tick in a zip-top plastic bag to save for testing or dispose by flushing down the toilet. If you notice a rash or develop a fever after finding and removing a tick, then contact your doctor.